MUA have launched some gorgeous new products for this Spring. I was sent a handle of them to try and so I wanted to share with you one of my favourites which is the new Sweet Sheen lip balm collection. These add just as much colour as a lipstick would but moisturise your lip at the same time. So they don’t have a lipstick texture but more a lip balm. The colours are so fab and go from a dark red to a baby pink. 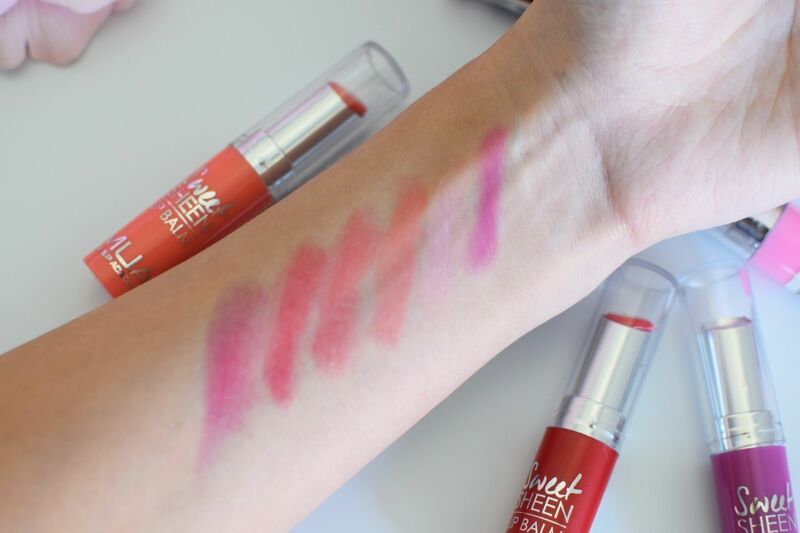 When I first went to try these I thought the colour would be very subtle and you wouldn’t really see it all, but I was so wrong and absolutely loved the pop of colour that they gave, as well as the soft texture, which was a nice change to lipstick. Lipstick can be so drying in winter for me so these are perfect to start wearing as we come into Spring. There is actually also a lip primer in the new Spring collection which is also a balm stick and acts as a great base for before lipstick. So let’s take a look at the colours. The best bit yet is that they are only £2 each so no excuse not to stock up on all six. For an exclusive 10% off enter the code ‘MUATLD10′ at the checkout on www.muastore.co.uk until March 4th. Wow only £2 each is an absolute bargain! I love the sheer texture.